It was not only my parents who forced me to change my mind when I decided to travel alone in India; most of my acquaintances including my beloved boyfriend, my friends, and even my boss at part-time job begged me not to go. The reasons were obvious: first, travelling alone, second, being a woman and third India being too dangerous for a solo destination for a girl. There has been noxious international news recently about how travelers in India have been kidnapped, threatened, harassed and so on. I realized the point of what they were saying. To be honest, I, myself, was worried as well because this was the first time to ever travel overseas alone and this girl chose one of the most challenging countries of all. Why not just go for easy places like Europe or East-Southern Asia where I could just rest and kick back? After those four semesters of deadlines (both for school and magazines) and magazine work, I was totally exhausted with the hectic lifestyle I led. My mind was surely looking forward to a hot and breezy casual vacation just like one can see in an advertisement. But what intrigued me was this &#8210; trying something that I had never done before. Doing something crazy! The answer lied in India. Most of all, I was starting to get too used to group trips where bunch of unfamiliar people do the same thing, eat the same food, and view the same sights. I really wanted to feel a foreign country, meet the people who lived there, eat some exotic food which is not adjusted for a foreigner’s picky tastes, and manage my own time wherever I stay. No sooner did this passionate university girl decide on a destination than did she began to schedule her rather short three-week trip to Nepal and India in a thorough way. It took almost a month to prepare. So my trip was off to a rigid start. Roman and I took the bus to go to Gorakhpur. After a tiring day of busriding from Nepal, I dozed off until when suddenly, the drivers asked us to get off the bus. The bus had broken down in the middle of the road. So, together with Roman, I rode the tuk-tuk (motorized rickshaw) to the station. It was stupid of me to imagine that there would be a train for Varanasi straight away as soon as I arrived in the station. There was one with a standing room only at 11 p.m. The next one I could get was at 5 a.m. Roman and I had no choice but to sleep out in the open until the next train arrived. Every foreigner would be surprised to see Indian people sleeping outside in a row at the train station. It is no wonder that every Hindu person carries at least two pashminas. A unique but harsh experience, indeed- I would not do it twice. Overnight in a Northern Indian train station was a bit of chilly for those who love breezy sunny weather. I was hungry, drowsy and cold. The arrival of our train bound for Varanasi was like the call of Messiah. Second Air Conditioned (AC) Class of this train was surprisingly cozy and comfortable. Finally, on the 17th, I stepped my foot into Varanasi. Even after this hardship of border-crossing, another thing panicked me. My wallet had been pick-pocketed on the way to the Main Ghat (staircases connecting the river and the town). I usually kept my money and belongings with me securely, so it was my first time ever. Due to Godaulia’s (market place) boisterous ambience and my hunger, I realized this about an hour after it had happened. Panicked, I was on the jig in Raga Cafe. In my wallet, I had 4,000 Indian Rupees. Luckily, I was wise enough to separate US dollars, passport, and ATM cards. Later, when I chatted with a Canadian lady, Dorothy, in Pondicherry, she told me that 4,000 Rupee was really nothing after all. Dorothy also told me with just that amount of money being stolen that I should feel safe that nothing important went missing. I must admit to you now that I immediately forgot about my stolen wallet and money the same day I lost it because I met the most wonderful traveling companions. I stayed with them for five days in Varanasi. When traveling, people say it is more important whom you are with than where you go. This panicked reporter needed some good company and a good guest house. If not, I would be very lonely and melancholy in rainy Varanasi. Two sisters and a gentleman asked me if I needed any help and suggested that I go for a boat ride since the guest house they are staying at is quite okay and always has vacancies. The boat ride really relaxed me at that moment. Drifting through the most holy river of Hindus, my agitated mind flew away with the flow. This boat ride on the Ganges was on the first day of my arrival I went boat riding on the Ganges River. Ganga (also as Ganges) and Jamuna Rivers are like twin main lifeline sisters of India Subcontinent. Many devoted Hindus come here to purify their souls. Beside some travelers like me, there were many Indian tourists, and people who come to meet their death. Indian funerals are interesting. Right after the death of a Hindu person, funerals must be done within 24 hours. That is what makes Varanasi a place in India swarming with people. 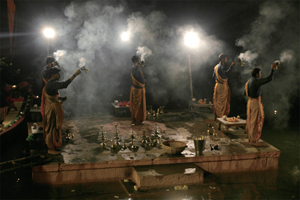 A lot of Indian people all across the country visit Varanasi waiting for their ever-after in the Ganges River. There was also the Burning Ghat (Indian crematory) where people burn the dead bodies after the funeral. 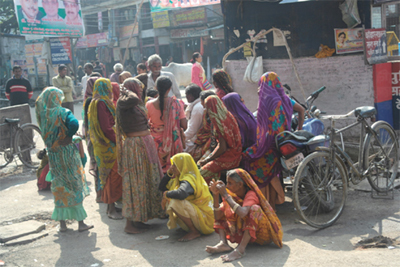 For Varanasi locals, death is a part of their routine life. Every hour or so, for four or five times, I could hear undertakers shouting funeral chants and carrying dead bodies. People gathered around the Burning Ghat to watch the burning ceremony. I was already familiar with the burning smell since I have been to Nepal’s socalled Varanasi, Pashupati; they burned the dead bodies there as well. But for someone who has never seen this Hindu ceremony, the smell and ambience can be repelling. Little boys and girls row their own boats to sell dias (little butter candles decorated with flowers) for dinner ceremonies - people float dias at sunset. The Ganges River was full of people yet, strangely, kept her peacefulness. In my mind, the Ganges River was full of life and death at the same time. After an hour of floating down the Ganges, I found my shelter, named Mishra Guest House. Of my five days in Varanasi, three of them, were raining cats and dogs. It was the dry season, not the monsoon yet during my stay, Varanasi was soaked with raindrops. For Indians who see rain as good omen, they welcomed the rainfall. Mishra Guest House had a little rooftop restaurant where guests could enjoy some hot meals and a grand view overlooking the River and ghats. With this heavy rain, my company and I were determined to wait until the weather had cleared up. Listening to those heavy raindrops, I could just sit back and peacefully enjoy my own time or chat with fellow travelers. Interestingly travelers get along well with each other regardless of their nationalities in India. After the rain shower, my friends and I went out to drink the tastiest lassies in India. We would sometimes call the city Vara‘lassi’ rather than Varanasi. 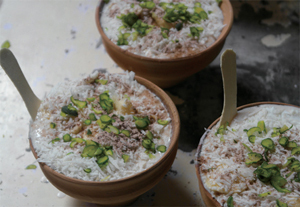 Bottled in earthenware, Varanasi lassies are decorated with fresh pistachio and fruits . a taste that makes people forget about all their worries and sorrows. Siwon Lassi Shop was always full of visitors- locals and even tourists, too. I used to have two or three bottles of small lassies all at once. On sunny days, we would bargain for a boat for an hour or more just so we could float about the ghats and take a nice nap on the boat. No disturbances, and peace was within a single boat handled by professional boatman. I read Life of Pi, where I found this quite beautiful and memorable line: 'Vishnu, the Supreme Soul. The Soul of all things. Vishnu sleeps, floating on the shoreless cosmic ocean, and we are the stuff of his dreams.' 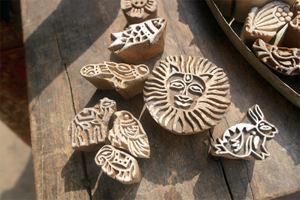 Floating inside the boat, I felt myself becoming Vishnu, daydreaming about my travel and the wild India I wanted to see. At last supper, my three lovely companies and I had our first and last toast to our last night together with King Fisher Indian beer. The next afternoon, I got on the train to go to the blue city Jodhpur at Varanasi Junction station. For Koreans, the blue city Jodhpur is a place of destiny. Why? It is because the famous Korean movie Finding Mr. Destiny (Kim Jong Wook Chat-gi, .....) was filmed here in Jodhpur. I am a big fan of this movie, the original work, and the musical as well. Thanks to this movie, a lot of Koreans visit Jodhpur every year which makes this Rajasthani city familiar with Koreans like me. I could dare say almost the whole city knows this movie. For foreigners, I told this somewhat Korean version of ‘Letters to Juliet’ whenever they raised question to me why there were so many Koreans here. 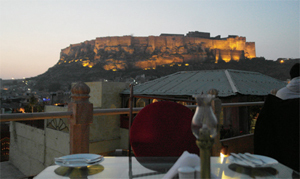 Some say that the movie made travelers to overly romanticize Jodhpur and this has made them prone to disappointment. Yet, I enjoyed Jodhpur more than anybody else. The moment I arrived at Jodhpur Junction Station, I was not sure if the city was even blue. But after the friendly Hill View Guest House family picked me up with their motorcycle, I realized that I was wrong. As I approached my future guesthouse, which is situated just in front of the Mehrangarh fort, the highest place in blue city, I could view the rich blue color of this city. The famous nickname, ‘blue city,’ was named after the vivid bluepainted houses and walls. I still consider coming to the Hill View Guest House the best decision I have made in India. This place was run by two sisters, Ms. Zafran and Raja. Lady Zafran is a local politician. Hill View was well managed. At the guesthouse, I saw one of the neatest and most well-organized bathrooms ever in India! It was so popular I had to wait for some guests to check out. While I was waiting, more guests kept on coming in and in and not checking out. I ended up sharing a double room with another traveler from Japan, named Kumiko, for a reasonable price. Apart from the cleanliness, the two ladies of the Hill View were very popular with their cheerfulness, humor, and welcoming nature. Here, I met most of the people whom I became friends with during my trip. Jodhpur was like heaven for me. It was always sunny. which is why it is also called “sun city”. and filled with a beautiful and unique Rajasthani color sensations. I was always busy making new friends with people who stayed at the Hill View and the guesthouse family. Just the day before, Ms. Zafran asked me to go to a wedding dance party at her nephew’s house. I was curious about Indian wedding culture so it was a lucky chance for me. Until the dance party at 10 p.m., I relaxed myself at a rooftop bar in a nearby luxuriant hotel until the party. I had never been able to afford extravagance until then, so I treated myself in most luxurious manner possible in India . drinking a glass of Mojito in a bar alone. 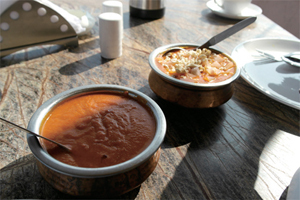 The drink was served with the Indian snack papadam. I spent my time writing about what a wonderful day I had, while sipping my Mojito. I felt as though I had become Hemmingway in Jodhpur. At night, I got to experience actually saw how Indians celebrate weddings with dance and music. They usually hold a huge party before the wedding day for about a week to ten days. Parents of both the bride and the groom hire some professional dancers and encourage neighbors and friends to have fun. 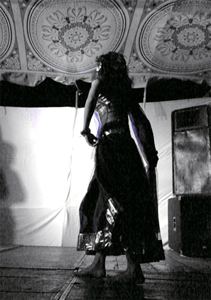 From my point of view, Indian people were joyous people who knew how to enjoy music, dance and art. Almost everybody, regardless of age, was enjoying the wedding party. Although I did not like that there were too many guys trying to flirt with the young beautiful dancers, it was still interesting to see an Indian dance party. That was my last night in Jodhpur. Though my stay in the blue city was only three days, I was never alone wherever I went. The blue city healed me with joys and new experiences. Looking back on my whole trip, I realized that I had been very greedy. I moved around too much just wanting to see more of India while I could have enjoyed more time in one or two places. Despite my busy travel itinerary, I was fully satisfied with my decision to come to India. Nice travelers, friendly locals, delicious cuisine, unexpected and yet fun events, and so on. Most of my acquaintances told me that I was really brave to go off to an exotic nation alone. Yet, sometimes bravery is essential when you want to take the first step towards some adventurous trips you have never done before. For me, it was far more than ‘worth it.’ My motivation for me to leave for India was triggered by incapability to hold my wild imagination about India in books and pictures of other people’s stories. I decided to make my own story in India. India was always filled with unexpected moments and abrupt changes, but that was what I liked about India the most. Now, I can see beyond what has been written about India from books, and that is what made this trip matter to me.